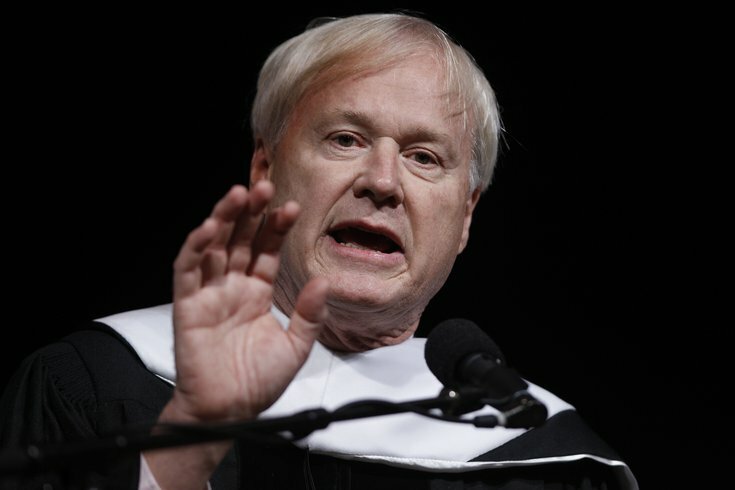 The host of MSNBC's "Hardball" Chris Matthews at Temple University's commencement Thursday, May 12, 2011, in Philadelphia. In a column for The Washington Post, television host Chris Matthews has endorsed Philadelphia as the right choice for the Democratic National Convention in 2016. When I was growing up in that city, my mother took my brothers and me to see the Liberty Bell, then still in Independence Hall. She also took us to Carpenter’s Hall, colonial Elfreth's Alley and, of course, Betsy Ross's house. She wanted her children to know the history of our city, which was so vital to the beginnings of our country. These historic sites are within quick walking distance of Philadelphia’s convention center. When Democratic delegates from all over the country arrive in July 2016 they could visit much of their country’s revolutionary history without leaving Market Street. Matthews goes on to explain how he believes the Republicans have done a much better job with their national events, but the Democrats could one-up them by holding the DNC in Philly. This isn't the first time Matthews has lobbied to have the event in Philadelphia. He did so back in October of 2014 on his MSNBC show "Hardball."